I want to start this off with a bit of a personal preference disclaimer: I am in no way bad talking any of these base products, as this post is simply just about my recent switch from using full coverage foundation products to the lighter alternative of a really great quality BB cream. This is not to be mistaken with the process of me lightening the colour of my foundation either. Let’s rewind back to the time when every morning I would reach for one of my favourite medium to full coverage foundation products. Usually during my morning makeup routine I would find myself applying the Tarte Amazonian Clay 12-Hour Full Coverage Foundation. I would switch in a couple other foundations from time to time, but this was my go to product because of all the coverage it gave and the fact that it lasted throughout the day. I have heard countless times that some days you need to let your skin breathe and to not always reach for the full coverage foundations, but I needed the coverage. Fast forward up until about two weeks ago. I was sorting through my box of products that I haven’t used or are just currently not using and I pulled out a tube of Laura Mercier Tinted Moisturizer that I had gotten in a 500 point perk from Sephora several months ago. I had given this a try before, but I felt the need to try it again. I gave this product another chance and had much better results this time around. It wasn’t the greatest coverage, but I convinced myself to let the idea set in that it is a light coverage product. In fact, it’s in the name. It is just a moisturizer that is tinted with a bit of colour. I tried this for another day or two and was getting used to using a lighter coverage base product, but then I pulled out a sample sized item from my unused product box and everything changed. The sample product was of the Dr. Jart+ Black Label Detox BB Beauty Balm. It was good enough for once use and I was in love with the formula, the coverage, and its universal shade that is able to match my rather fair my skin tone. I had dabbled in the world of BB creams before and had one hit that was a shade too dark for my skin tone, and a lot of misses that I did not care for at all. I knew right away that this was going to be a future holy grail product and that I had to go buy the full size product. Only a day or two later I made the purchase and have been using it since. This lightweight product is purifying face cream that hides uneven skin tones, purifies and calms blemish prone or sensitive skin, with an added bonus of SPF 25 sun protection. For the price I paid for it, I’m glad it does all of the above! The tube itself is rather large and should last me a good amount of time. I love it even more because it is a tube container with a pump dispenser, making it very easy to control how much product you end up using. It blends very easily and any extra spots and face demons that need more coverage can be fixed with a concealer. I feel that it is not heavy on my skin and probably a much healthier alternative for my skin than the products I had been using before. When the day comes that I need that long-lasting full coverage, I know that I still have my other great foundations to fall back on for that nearly flawless skin effect, but I will be saving that for the days that really need it. I hope you’ve enjoyed reading about my switch to a lighter coverage base product, and that it may have provided you with the extra push to go a bit lighter on the foundation side if you were considering making the switch yourself. 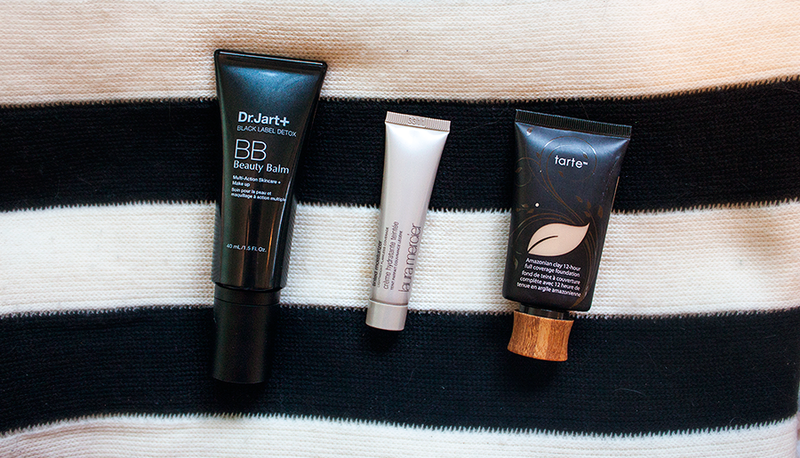 This lovely BB cream is here to stay in my everyday makeup routine!